During the last months of 2014, Iban EB3FRN and me were recording meteor head echoes using Graves. But to make things interesting, we synchronized the recordings using a PPS GPS signal. The idea was to analyze the Doppler from the head echoes and and see if something useful can be extracted from them. On paper, the procedure was easy: We recorded a stereo wav file, with the output from the receiver in one channel, and a PPS signal in the other channel. Then, both wav were synced using those PPS signals into a simple stereo wav, with one receiver in each channel. Reality was quite different. Do you think your sound card record sound at the specified sample rate? No, it doesn't. They are sightly off, and the sample rate drifts with time. We are talking of errors about 0.2 to 0.5 samples per second, enough to be noticed after some hours. After resampling the wav files to 48000.000 samples per second, and align them, we finally get more than 60 hours of double station Graves recordings made during the nights of August 30 to 31, November 16 to 17 and 17 to 18 (Leonids) and December 13 to 14 (Geminids). A lot of interesting things can be heard in those 60 hours, but this time we were looking for head echoes received at both locations at the same time. We found 62 head echoes received simultaneously on both locations, and you can see / watch them in this video (better with headphones). Mtx is the position vector from the meteor to the transmitting site, in km. 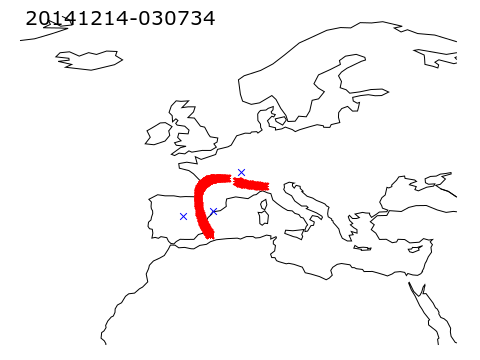 Mrx is the position vector from the meteor to the receiving site, in km. F is the transmitting frequency, in Hz. 143050000 Hz for Graves. c is the speed of light, in km/s. And · denotes the dot product between vectors. The problem is these two formulas have no inverse. You can calculate the Doppler and the Doppler slope from a known meteor at a given position with a given velocity, but you can't calculate meteor position and velocity from the Doppler values. One of the reasons is these formulas have the dot product. You can calculate the dot product of a pair of vectors, but given a dot product, you can find an infinite number of vectors whose dot product is exactly the same. What does it means? For a given Doppler and Doppler slope you can find an infinite number of meteors that will produce the measured Doppler and Doppler slope. But what about the Doppler and Doppler slope from two locations? Could it solve the meteor? Or at least, reduce the solution set to something useful? It was worth trying. UTC. Note how weak is the red trace. 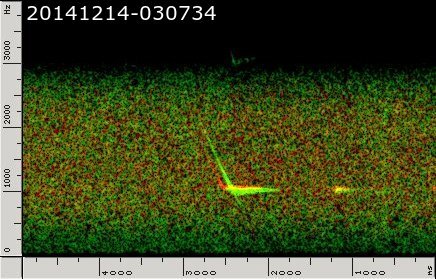 This meteor were recorded almost at the Geminids' peak, so it is probably a Geminid. 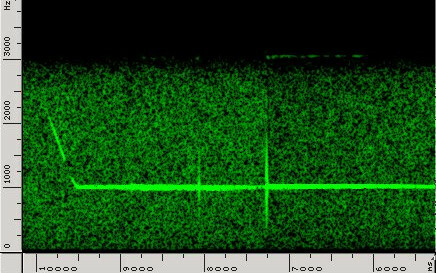 At a given time it produced a Doppler of 694 Hz with a slope of -2960 Hz/s at Iban's receiver, and a Doppler of 386 Hz with a slope of -2643 Hz at my location. For convenience, the script also produces some other output data along with the cartesian coordinates, like longitude, latitude and height above sea level ( Mx, My, Mz --> Lon, Lat, Asl ), Velocity ( sqrt (MVx*MVx+MVy*MVy+MVz*MVz) ), Right ascension and declination (Ra, Dec) elevation over local horizon (El), distances from Mx, My, Mz to transmitter and receiver sites (Dtx, Drx1, Drx2), and signal traveled distance (STD1, STD2). Each red pixel in the above image is a solution of the previous meteor. 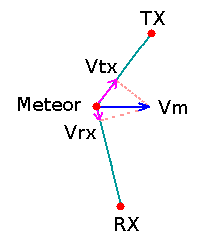 This is, a meteor placed in that point (Mx, My, Mz), with a given velocity and direction (MVx, MVy, MVz) produces exactly the observed Doppler and Doppler slope at each location. Position: It can be seen in the image. Some solutions are under ground, and some of them are very high. It is known most meteors burn around 90-100km. Over 100-110 km they are still unburned, so no radio reflection is possible. Under 80km most of them have been disintegrated, so keep solutions between 90 and 100 km seems reasonable. Velocity vector: The meteor must fall from the sky. So we can discard meteors (solutions) "going up", this is, coming from a point under the local horizon. Distance: Because of earth's size and curvature, a meteor burning in the upper atmosphere can be seen at a given maximum distance. Ham radio operators have determined experimentally that the maximum possible distance using meteor scatter is about 1400 miles, or 2250 km. This means one observer in earth surface can't see a meteor farther than half that value, this is 1125 km. Let's round that number to 1200 km, to allow observers higher than sea level and some possible tropospheric diffraction in the extreme cases. In this way, a possible solution for a meteor, must be under 1200 km for both observers, but it must be also under 1200km from the TX site, in this case, the Graves radar transmitting site. So, we can discard solutions at more than 1200 km to any of the observers, or transmitting site. The solutions also draw a curve in the sky, and surprisingly, this curve pass over the radiant of the Geminids (AR: 7h 28m, Dec: +33). Looking for the solutions at that point in the sky, all of them are located at longitude 8.1º east, latitude 45.1º north (near Turín, in Italy) with a velocity around 38 km/s. It is interesting to note Geminids have a velocity of 35 km/s. So, it seems the above meteor was indeed a Geminid, who fall in Italy, near Turin, at 38 km/s. Exactly the same procedure were applied to these 39 meteors, and 37 of them produced "possible" solutions (all of them except 20140831-032936 and 20141214-031451). Because no major shower were active that day, this map only gives a general image of how solutions looks once projected into the sky. Comparing this map with the previous one some patterns are visible, but the most important thing you can see in this map is no solution pass even near the Leonids radiant. And this is bad. Quite bad. But they can come from everywhere else in the sky along the solution lines! There is not guarantee these meteors to be Geminids, although probabilities are high. Once all the possible radiants of a meteor are plotted into the sky, there is no way to know who of all them was the real one. 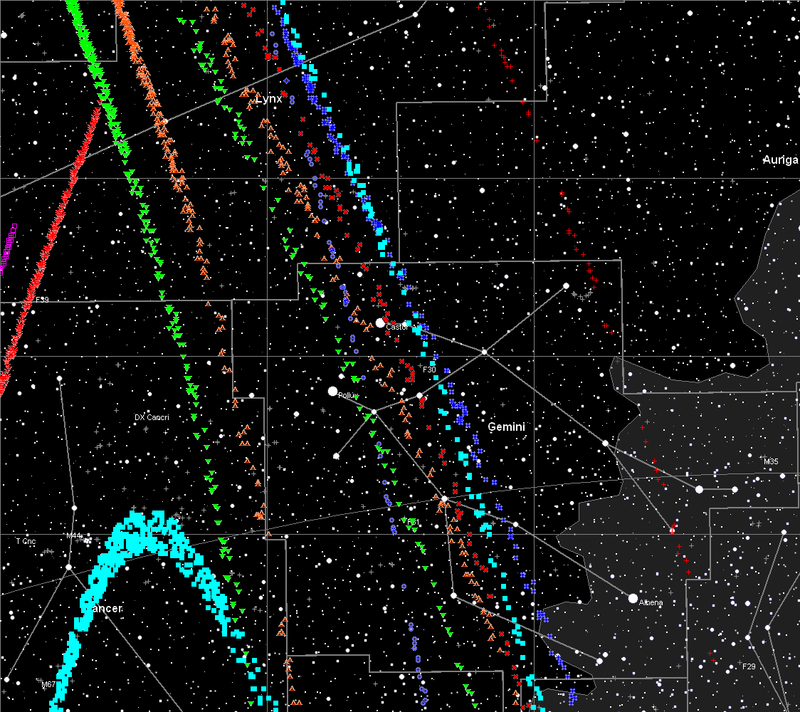 Doppler only measurement from two different places is not enough to determine a meteor radiant. But don't forget with some meteors, suspect to come from a known shower, the possible results includes the right radiant at the known meteor velocity for that radiant, so there seems to be some solid base fundamentals in this experiment. 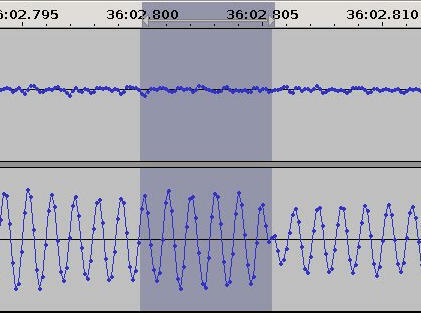 One of the things you learn listening over 60 hours of double station Graves recordings is Graves changes its beam in sync with the UTC time. The beam makes the first change at each start of the hour and changes every 0.8 seconds exactly, so the whole sequence repeats every 4 seconds. When you record Graves signal during a beam change, you notice a change in amplitude, but also a change in the phase of the received signal. This phase change appears in FFT displays as a "click", a vertical trace in the FFT. Measuring the difference in time between your PPS signal and the phase change, you can calculate how many kilometers has travel the radio signal from Graves to you after bouncing into the meteor. Measuring the time between Graves' beam change and phase change with Audacity. In this example you can clearly see the phase change a bit after 36:02.805, there are 44 samples between this phase change and the beam change that was produced at exactly at 2:36:02.8 UTC. These 44 samples at 8000 Hz sample rate equals to 5.5 milliseconds, that means the signal traveled 1649 km. Unfortunately, phase changes are not very common in double station, because they are clearly visible in the tail echo, and the tail echo is strong at one receiver or at the other one, but rarely at both. The tail echo footprint seems to be much smaller than the head echo footprint. Just in case you want to do something similar, you can download my meteorsolver.m script from here. It is an Octave script and should work in in any platform Octave has been ported to. Usage is very simple. Edit the file meteorsolver.m and set the appropriate values for TX, RX1 and RX2 coordinates. Values are in degrees. West longitudes are negative. datetime is the UTC time of meteor, in format YYYYMMDDhhmmss. 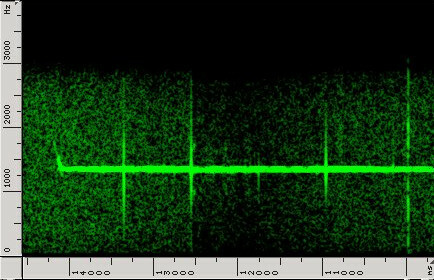 rx1doppler is the Doppler value of meteor at rx site 1.
rx1slope is the slope of the Doppler of meteor at rx site 1.
rx2doppler is the Doppler value of meteor at rx site 2.
rx2slope is the slope of the Doppler of meteor at rx site 2. This will save solutions in the file results.txt. Let it run for some hours. This will save into results-filtered.txt all those solutions with heights between 90 and 100 km ($9 >= 90 && $9 <= 100), velocities between 12 and 72 km/s ($10 >= 12 && $10 <= 72), elevations greater than 0 ($13 > 0), and less than 1200km to any of the TX/RX sites ($14 < 1200 && $15 < 1200 && $16 < 1200). Then, you can use your favourite plotting program to plot output files. I used gnuplot. If you want to try yourself, or if you want to enjoy listening meteors simultaneously from two different locations, you can download a wav file here. This wav file is one of the 62 files we recorded and probably is the most intesting because it was recorded at the peak of the Geminids shower in 2014. Left channel is EB4FRN and right channel is EA4EOZ. Please, use headphones! The file is one hour long, the first sample of the file corresponds to December 14, 2014 at 03:00:00.000 UTC, and it was been recorded / resampled at exactly 8000 samples per second, so you can do precise measurements if you want: the file includes some of the meteors presented here. Although it is exciting to see how a meteor Doppler signature changes received from two different locations, it has very little value if you want to do something more than plain radio meteor counting. Two different receivers does not provide disambiguation so all you can determine is a series of lines and curves in the celestial sphere where the radiant of a given meteor could be located, but nothing more. It is convenient to remember the double head meteor rate is quite low, around 1 meteor per hour. Also the method of brute force used in meteorsolver script is everything but efficient. I needed around 50 hours of computer time to get 4 million of solutions in a modern 16 core processor and it is not guaranteed to get something useful. Although statistically is possible, it is quite rare we didn't catch a single Leonid. Maybe the meteorsolver script failed to find a solution near the radiant. It's difficult to know the exact cause. I feel the amateur radio astronomer is really far for professionals in the meteor field. Just compare my results with a dedicate meteor radar. They are light years ahead. It seems for many years ahead the amateur is doomed to perform only meteor counting. I wish to thank publicly to Iban EB3FRN. This experiment would never have been done without his patience and CPU power. Great article. Tnx for sharing.